I've been neglecting my blog the last few days. I've been knee deep in some paperwork and by the time I've put it away for the evening I'm ready for bed. 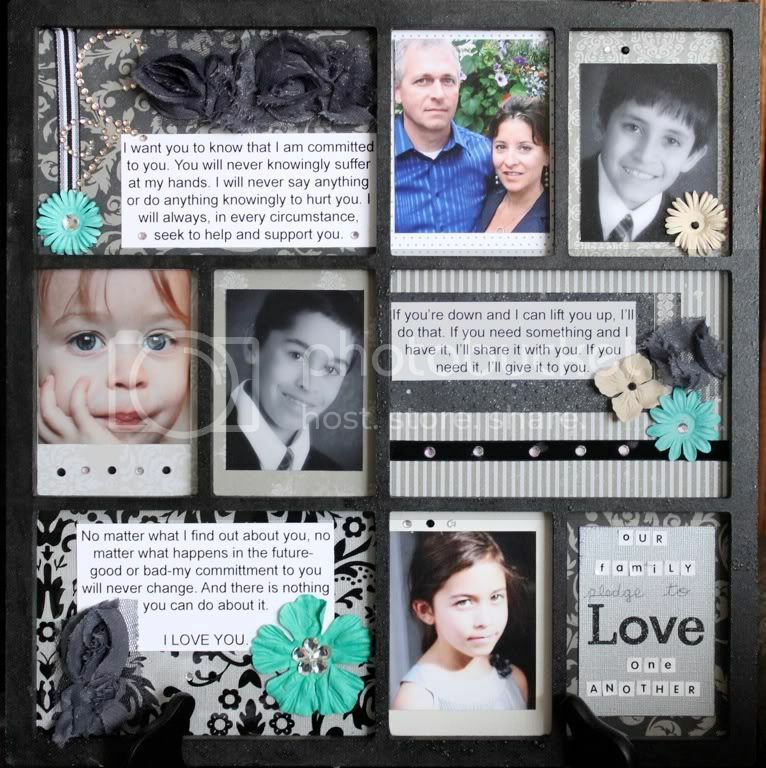 I painted this Kaisercraft frame with Glimmer Glam and used supplies from the Scrapshotz January kit. I also added some gems with the iRock, Prima flowers and a couple of Chatterbox flower centers. The "pledge" is from the bible study I am currently taking entitled "Lord, Change My Attitude". It really stuck in my mind and I wanted to display it somewhere we all would see it on a daily basis and this empty frame was the perfect place for it. I also tackled these first day of school photos from this school year. I used some OA on this layout. Vintage is not really my style but I also have fun challenging myself to use products that are not my usual syle. 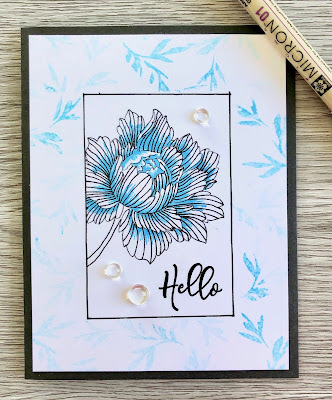 I finally used this Studio Calico stamp as a border around the edge of this page. Now that I see this page I'm wondering what I was thinking putting that square of dark grey cardstock in the upper left corner. It doesn't seem to belong. Oh well, not every layout is a masterpiece! I really like the wood look alphas! 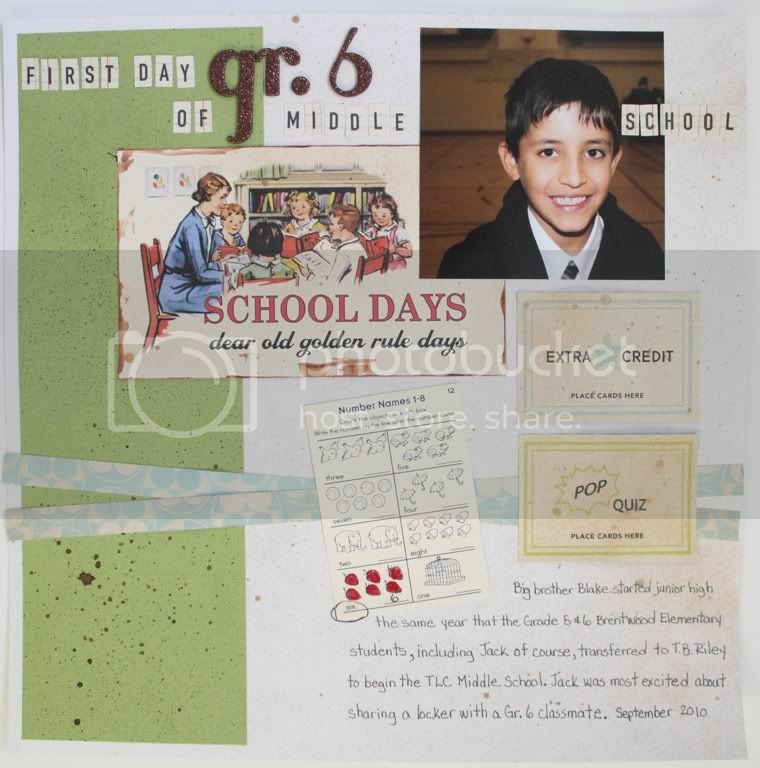 I have one last first days of school layout to finish and then it's on to the school portraits, I may actually be all caught up with the kids school photos until the end of the year!